I've had this account for a few years and only posted a handful of times, figured I should log in again and try being more active this time around! I started collecting My Little Pony in summer of 2011, after I started watching FiM. In these 6 years I've gathered up a collection of over 400 ponies (including normal ponies, smaller ones, plushes, and pony-shaped merch like piggy banks, etc) and some various pony merchandise. I collect every generation, but my favorite is G1, followed closely by G3. I love them all dearly though! 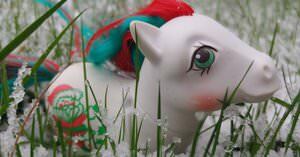 Spring Song is my favorite pony in my collection! Hi there! I am new to the MLP community and came across the Trading Post whilst rekindling my interest in collecting G1 ponies, books, and comics. It will be nice to come across some like-minded pony people! Welcome to the TP! It's great to have you! Do you display your collection at home?